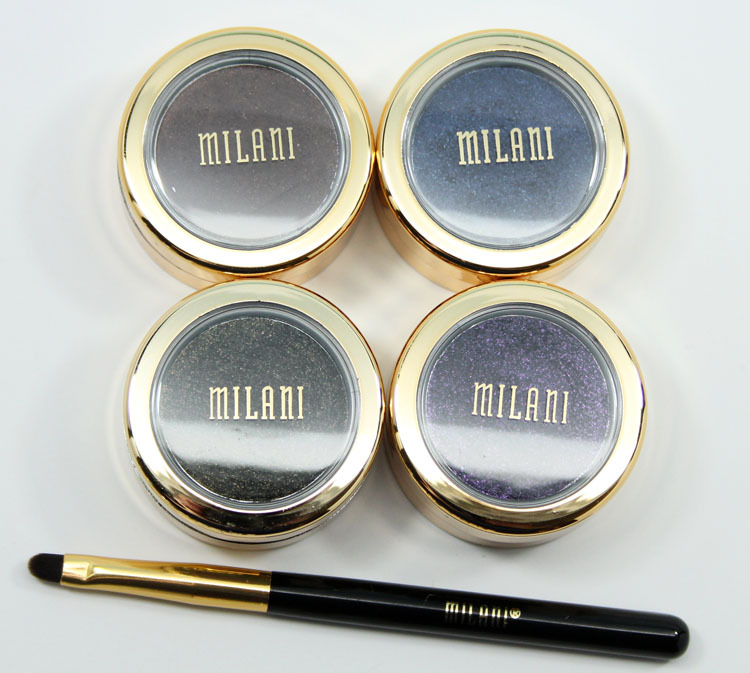 There are four new Milani Fierce Foil Eyeliner shades coming to a drugstore near you, are you prepared for the awesome-ness? 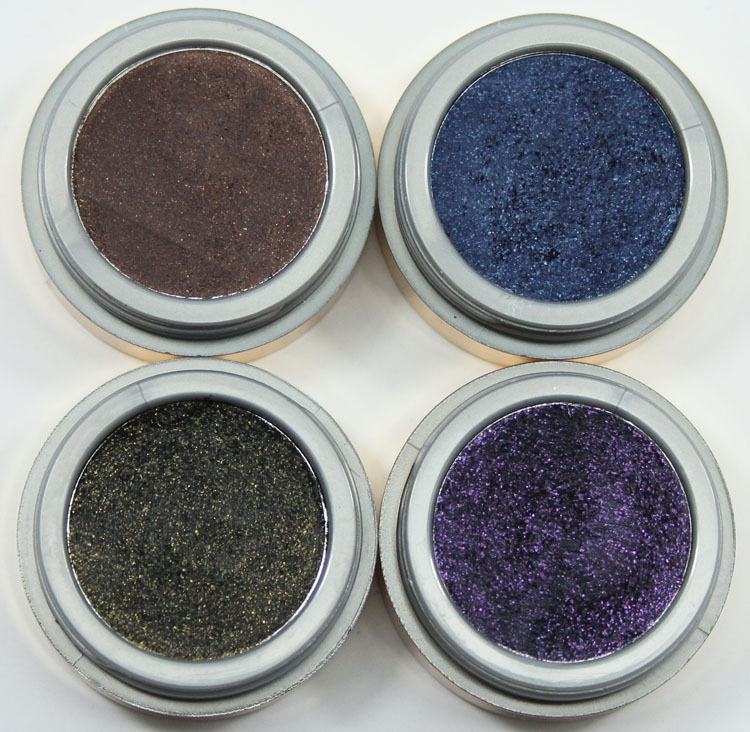 These are long-wear gel liners with a rich metallic foil finish. Really what they mean is sparkly, but they are still cool. Each one comes with a little applicator brush. I’ll be honest, I wasn’t really too sure these would be all that great until I swatched them. They turned out to be incredibly pigmented! 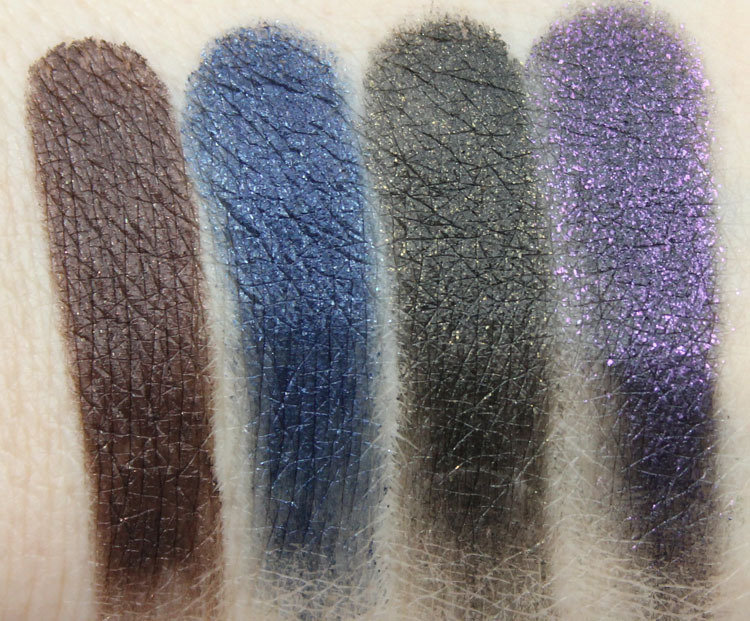 All my swatches below are just one swipe, which is pretty amazing. You can use them as an eyeliner or even as an eyeshadow base if you are going for a seriously intense smoky look. Brown Foil is a deep, rich brown with golden shimmer. Navy Foil is an intense navy blue with light blue shimmer. Black Gold Foil is a jet black with gold shimmer. Purple Foil is a deep purple with bright purple shimmer. Color me impressed. These feel nice and look really nice. They aren’t super creamy feeling, they actually feel a little dry at first but you get great pigmentation from them anyway. They don’t dry too quickly, so you have a couple minutes to play around with them before they are set. It seems as though the glitter isn’t just sitting on the top, but I haven’t dug down into one to check for sure. I really love all these colors but especially Brown Foil and Black Gold Foil. These will be at CVS and are $6.99. Interested in these or passing? I’m glad they (hopefully) put the glitter throughout the whole product, I remember hearing all the complaints from the glitter overspray on their galaxy liners! I didn’t have an issue with the galaxy ones smearing on me when I wore them. And yes these do seem to set and stay on me. These are really pretty!!! Really nice swatches!!! I am LOVING that brown too and that purple is equally as outstanding!!! I only have the brown one and of course now I can’t find the others. I was surprised at the pigmentation and want more shades. Your purple swatch is fabulous. That blue one is calling my name! I passed on the galaxy ones b/c I didn’t want just a glitter overspray…. but these might be just what I’m looking for! These are beautiful, especially the brown! That purple is to die for! I hope my CVS will eventually get these, it’s always so behind on any new releases. I bought the brown one and have already returned it. It looked really nice initially but it did smudge on my oily eyelids after about 4 hours of wear. I tried wearing it both without and with a primer and still had smudging and running at the corner of my eyes.